Twitch viewership numbers have become one of the core elements in esports sponsor proposals over the past few years. Some teams and events present numbers around total minutes or hours watched. Others look at the number of people who have viewed individual streams or rolled up numbers for the streamers they have on their books. The challenge with these top-level numbers is that they don’t provide a real picture of what is happening. If you sign a sponsor who then asks “how many times was my logo seen and by how many people” or “what is the ROI for the money I’ve given you” it can be difficult to answer. If you want to focus on the top-level numbers then Waypoint is a useful tool for doing that but for anything else, you need to think like traditional sports. Traditional Sports have a tried and tested method for calculating media value and ROI. A 30-second ad during the 2017 Superbowl sold for roughly $5M USD. That’s about $166K USD for every second of the advert that is shown. So how does this relate to Twitch viewership and sponsor proposals? If we walk through the numbers we will start to see why Twitch viewership should be calculated differently and how it can support your sponsor conversations. The Superbowl in 2017, on average, generated 111M viewers. That is a big difference from the breakeven point for this advertiser. Taking 111M viewers as the average across the duration of the match and $166K per second cost of the advert we can start to calculate the return. Let us take it as 1 cent per second which means for a 30-second advert the cost of 30 cents per eyeball. Again, this is a sizeable difference and means the advertiser is generating 70 cents for every eyeball they pay for. If we now take a look at value generated (ROI) we get the following. For Twitch viewership think about the number of times a sponsor logo is seen on a screen – it could be a total of 10 seconds per tournament. That 10 seconds has a value to an advertiser or sponsor and you can start basing calculations around it. You do 1 tournament a month and get 10 seconds of logo placement / advertising per tournament. The advertiser pays you $10K a month so that is $1000 cost per second. If you agree with the advertiser a value for each second viewed (per viewer) you can start calculating the ROI on the money spent. You can also work the other way to get an idea of how much you may be able to charge for this logo placement. Say the advertiser is paying 10K per month and they know that every view is 10 cent in value to their business. The NA LCS generates on average 140K viewers per match day and a team plays 1 match. So that could be 140K viewers seeing 10 seconds of logo placement. This means the advertiser has generated 46K USD of value per month from advertising with you / sponsoring your team. It is time to move away from metrics like total hours watched and instead focus on the value you can generate. Social Media. You can pretty much guarantee every esports team is using Social Media to promote content and build their team brand. The sad thing is that Social Media is great for some things but it isn’t a silver bullet and there are some things it is really bad at. One-to-one marketing is one of the things Social Media is really bad at. As consumers we have changed and we expect the brands we interact with to understand us. We expect them to know our needs and desires and be able to communicate with us effectively across multiple channels. In marketing circles this is what brands are driving towards – omni-channel marketing. Social Media is one of the channels you can use but it is one of many. What data is captured from Social Media that can be used to influence future communications with an individual fan? Very little and that is one of the things that puts Social Media behind other marketing channels. Using tools like Google Analytics and UTM tagging on links are great in determining what type of content fans are engaging with but once they visit the website what happens next? Unless you have other ways to capture data and other communication channels the only way you can try to engage with that fan is another Social Media broadcast. But broadcasts are having less impact and with Facebook’s most recent changes to News Feed it will become even more challenging to build engagement and visibility around content. As a customer you will already know which brands provide personalised communication to you and do it across multiple channels. Amazon is a great example of this. Once they have purchase history for you – the emails you get sent will provide suggestions on what to buy next. Their default communication channel is email because they know they can provide that personalised one-to-one experience. Amazon are also building up an understanding of you as an individual from your web browsing and purchase history. Can Esports answer the big marketing questions? The big marketing questions are going to hit esports teams now that more money is coming in to the space. Those questions range from “who is my ideal fan?” to “how should I communicate with them?” and “when is the best time to communicate with them”? Sadly Social Media doesn’t provide the answers to these questions which makes it much harder to market to and monetise a fan. Reach is a dirty word in a lot of marketing circles and if you’ve operated a Brand Page on Facebook you will likely have experienced the ups and downs. You will also likely have been headscratching as to why it changes and you can thank the Facebook algorithm. However, this post is not about how your Reach is going up and down based on the algorthim. I’m aiming to help you see things from a different perspective and position Reach as a more important metric than Follower numbers. Now you might be sitting there and calling me crazy but Reach is more important than Follower numbers if you are writing sponsorship proposals. Let us break things down a little bit. Follower numbers give you a base point from which to operate – 400K on a Facebook Page looks great at Level 1. Now if a Brand asked you the question “how many of those regularly interact?” you might have an answer or you might not. If the answer is a low number then the jump from 400K to that small number has just put your sponsorship/partnership conversation on thin ice. Why would a company want to sponsor you if you don’t have an engaged audience? Can you offer some data from those 400K that makes them valuable? Facebook’s algorithm means that roughly only 19% of your audience will see the posts that you make so let us take that as 80K for this example. Facebook provides some useful metrics in the background of your Facebook Page and a number of those are for engagement. Number of likes, comments, shares and so on. This gives you a better idea of how many people are engaging with your content and gives you a real world picture of your audience. 400K may now be a fantasy number. But this is where Reach can help. For every person that likes, comments or shares your content there is an increased chance other people will see that content. This is exactly the same way those cute cat videos are in your feed. Other people have shared them and the video is now visible to you. You weren’t interested and didn’t engage with a specific page but you have seen the content because someone you know took action. Let us go back to our example. 80K people are potentially the audience from your Page that Facebook will show your content to. So what about Reach? Well one person in that 80K could share your post and make it visible to their network. That could be another 1K people in the Reach reporting. Another Facebook Page could share it and now you are potentially hitting 19% of their audience and so on. In the Facebook reporting you have two metrics of Organic Reach and Paid Reach – you can pay to boost posts for greater visibility. 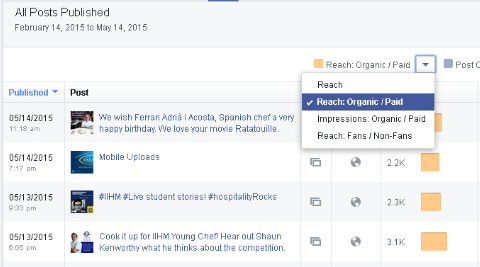 While this can confuse things the bit that is more important for your sponsor presentations is Organic Reach. On average, what has your Reach been over the past 3-6 months? Twitter also provides a similar type of Reach reporting so combining the two channels will give you a greater understanding of which channel is performing better. From here you can start to look at investigating Reach vs. Conversions for things like competition entries, subscriptions or merchandise sales. In a previous post I referenced Goals in Google Analytics – tying your Reach reporting in to successful Goals in Google Analytics is definitely the way to go. It also demonstrates that you know which metrics are important and this all adds to your credibility. Follower numbers may stagnate and that’s something you shouldn’t worry about. Instead, your focus should be on how you activate those Followers and how your content is seen by more people so that you can add more value to your partners. Google Analytics is a great analytics tools that’s not only free but also pretty complete. If you want to understand more about what is happening on your website then I definitely encourage you to get it installed. So what does it tell you? Google Analytics provides on an overview of your website (and other platforms like mobile Apps if you connect them) rather than a focus on individual and identified users. There have been conversations in marketing circles about how valuable this anonymous view can be but there’s definitely value in the data if you maintain perspective about the relevant context of that data. So let’s get in to the meat of it – what metrics and tools does it have that add value? At the high level it gives a view of traffic including number of pageviews, unique users, a geo-split so you can see which country your visitors are coming from and other useful metrics like bounce rate. A lower Bounce Rate is generally better as it means visitors are viewing more than one page when they visit your site however – sometimes a high bounce rate can be OK if you know what else is happening in your marketing world. Here’s an example – you use Social Media to promote your team or event content and host a giveaway on your website. Your Bounce Rate may naturally be higher as you’ve been able to drive people to your website from social, they’ve entered the giveaway and then moved on. The high Bounce Rate may not look good but the context is that you’ve been able to successfully drive traffic from social. You’ve also been able to capture individual user data from those visitors who entered the giveaway. Referrals (found under the Acquisition > All Traffic > Referrals menu) provides a good view of where some of your traffic is coming from. The websites that are linking to yours and have sent users to you will be listed in this section of Google Analytics. The details of how many sessions (not the same as people!) , the bounce rate, how many of those sessions are from new users will be displayed. The key thing here is being able to look at a time period – Google Analytics enables you to change the time period you are viewing. It also enables you to focus on a single referral source so you can plot over time whether one referral source is sending more or less traffic. Campaigns (in the Acquisitions > Campaigns menu) is another useful part of google analytics in that you can track specific links and activities that are driving traffic to your website. For example – I can use URL builder to tell google analytics the source of the visitor or the nature of the link the visitor clicked. This helps me work out which links and sources of traffic are performing the best. An example would be the giveaway mentioned above. I can post on both Facebook and Twitter with links that are being tracked differently thanks to URL Builder. Google Analytics will be able to understand them as different links pointing to the same page on your website. Through the Campaign section of Google Analytics I would be able to see which performed better – Facebook or Twitter. The screenshot above gives a view of the “name” of the campaign included in the link. The screenshot below shows the “source” of where the traffic has come from. There is a lot more to Google Analytics than the 3 sections previewed here. You have the ability to focus on conversions, do event tracking and set Goals for your web visitors to complete. For example – one Goal could be “register a new account” – the “thanks for registering” page would be your completion step and you can start to see where people drop out of this process. To finish this “Getting Started” post I want to also povide 1 big tip for team managers and marketing people and it is this – in the settings of Google Analytics you can exclude IP addresses from your results. This is huge for giving you a more accurate view of what is happening. You should exclude all the IP addresses of your staff so they don’t cloud your analysis.